I have an influx of oatmeal in my pantry… every time I go to the store I seem to think I’m out so I buy more. And of course when I get home I realize I have pounds of it! (I’ve had the same experience with foil and butter…. ) So I needed to find some ways to get through it apart from my morning breakfast. Thankfully, oatmeal can be used for a variety of healthy and tasty treats… granola and cookies being two of my favorites. The change of seasons also makes me warm up to those heartier breakfasts and the cold harsh winter in Houston. OK, harsh is probably overdoing it but we did get snow my first winter in Houston! After a few not-so-subtle hints from my husband I finally had a free evening to bake up some goodies. Remove butter from fridge and let warm to room temperature. Place chopped pecans on a baking sheet and toast in the oven for 8-10 mins. When you kitchen smells like heaven they’re ready. Remove from oven and let cool on the side. Line cookie sheets with parchment paper. Your cookies turn out so much better with parchment paper. I don’t know why but it works and then there is less to clean up! In a separate bowl, mix flour, baking powder, salt, cinnamon, nutmeg, clove and black pepper; set aside. In a medium bowl, cream together the melted butter, brown sugar and white sugar until it becomes a light cream color and fluffy in texture. The color should significantly change from when you start, so just turn up that mixer and let it go! Beat in the vanilla, egg, and egg yolk for 2-3 minutes until light and creamy. Mix in the flour mixture until just blended. 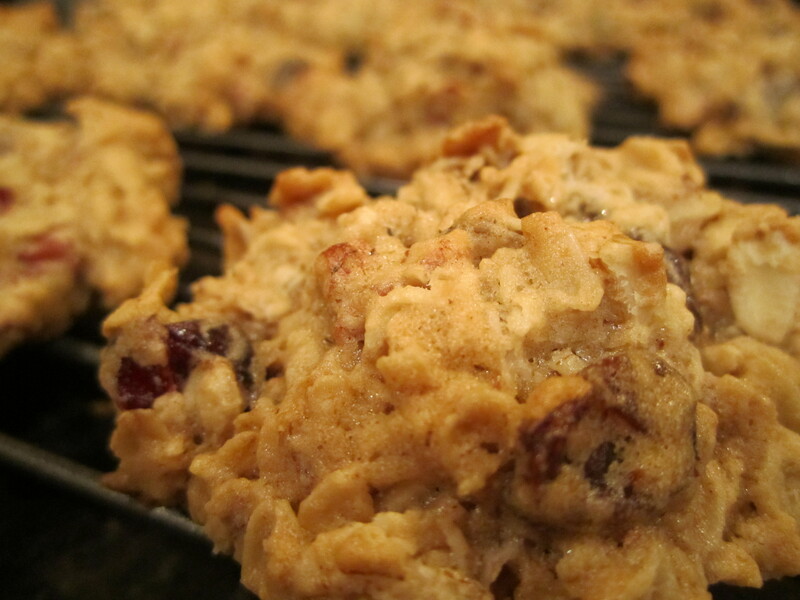 Add the oats, walnuts and cranberries and mix with a wooden spoon. Mix until just blended. Use a tablespoon and scoop out small balls of dough onto parchment lined cookie sheet and bake for 13-15 minutes. Do not over bake. The edges should turn very light brown, which is sometimes hard to see in the oven light, so I think I over baked these the first few times I made them. The centers should still be slightly soft. Let the cookies rest on the cookie sheet for a couple of minutes before transferring to a cooling rack (I usually try to eat one right off the tray and always burn myself… but it’s so worth it! Soft or crispy? It’s the never-ending debate for all cookie enthusiasts. I personally go for a soft center with slightly crisp edges, but let’s tell the truth here… any cookie is hard to resist. Cookies bring you back to your childhood, can turn around a stressful afternoon, and usually come along with friends, family and laughter. I wouldn’t encourage eating a whole batch, but share them with your friends after a BBQ or a day at the beach and you’ll be guaranteed a good end to your meal. I wanted to make a twist o the traditional chocolate chip cookie. I know, why change such a perfect thing, but I always like to try something new. Sometimes they work and sometimes they don’t. (I tried adding lemon zest into a back to oatmeal cookies to give it a zesty flavor and they came out tasting like a cookie coated in pledge. Fail. This one however received much better feedback.) As a spun my spice rack I noticed my nutmeg grinder looking sadly neglected after the eggnog-filled holiday months so I decided to break it out for the occasion. The nutty, warm scent of nutmeg mixed with the almond extract gives this ordinary cookie a flavor that makes your willing cookie takers say, “mmm, what’s in these??”. I made these especially for a coworker’s birthday and they were a big hit. By 10am that morning all of them were gone. And of course they cookies always seem taste better when they’re right out of the oven. If you miss that freshly baked taste, pop a few in the oven at 350 for 3 minutes and enjoy. In a large mixing bowl, beat butter, white sugar and brown sugar at medium speed until creamy and lightened in color. I recommend mixing it roughly with a fork so the sugar doesn’t go flying around the kitchen when you turn on the blender. Start slow and gradually bring up to medium until it’s a fluffy, creamy consistency. Add eggs one at a time, mix on low-speed until incorporated. And vanilla and almond extract and mix on low-speed until incorporated. In a separate bowl, stir flour, baking soda, nutmeg and salt. Gradually blend in the dry mixture into creamed mixture. Drop tablespoon sized balls onto ungreased cookie sheets. Remove from oven and let cool for 1 minute. Carefully remove cookies with a spatula and let cool on wire racks for 2 minutes before digging in. Return for seconds, and then pack up the rest for later. 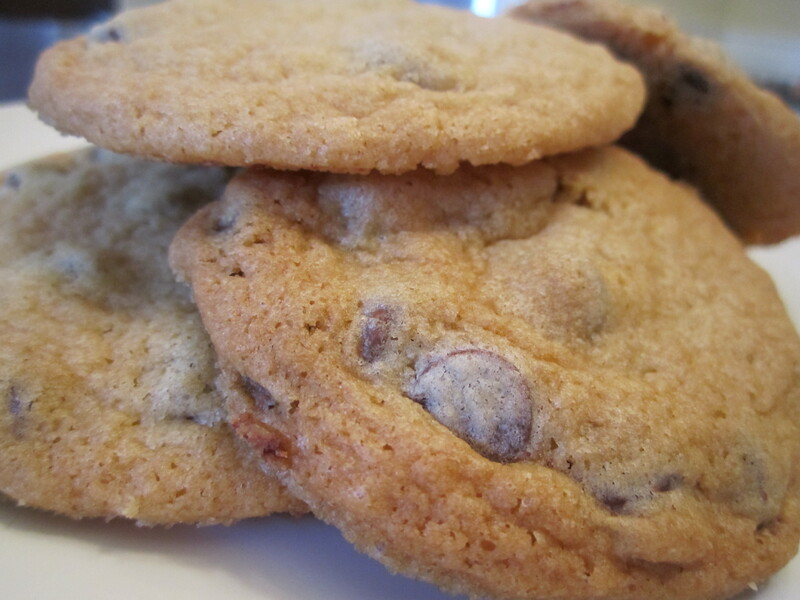 If you prefer crisper cookies, here’s a tip to making them more your style. It’s about the eggs, skipping them results in a flatter cookie with a great crunch. 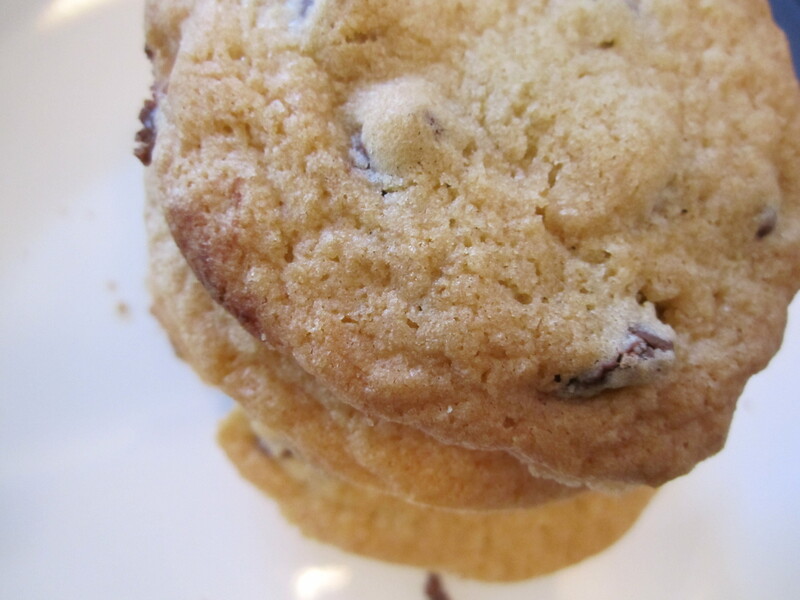 Super crispy, crunchy, chocolate chip goodness coming right up! Position racks in the upper and lower thirds of the oven. This helps the cookies crisp by being closer to the heat source or at the very top where the heat accumulates. Line two large baking sheets with foil with the dull side up. In a medium bowl, mix together flour, baking soda, and salt thoroughly and set aside. In a large bowl, combine butter, white and brown sugar, coffee, corn syrup, milk, vanilla and anise. Mix until smooth. Slowly add the flour mixture and continue to stir with a wooden spoon until incorporated. Add chocolate chips and stir until mixed. Place 5 pieces of dough least 3 inches apart on each lined baking sheet. Use your fingers covered with a piece of plastic wrap to flatten each scoop until it is 3 inches in diameter. Remember, the cookies will spread even more as they bake so leave room! Rotate the sheets from the top rack to the bottom and from front to back. Bake for 7-10 more minutes, watching closely, until the cookies are evenly dark golden brown all over. Pale cookies will not be crispy. Slide the foil with cookies onto racks. When the baking sheets are cool, repeat with the remaining dough. Cool cookies completely before snacking, stacking or storing. Water chestnuts are a texture food, and are prized for their crispness. They add a great crunch and slight earthiness to any salad, stir fry, or curry, and are a good source of potassium and fiber. When rummaging through my pantry the other night for something to add to my corn salad, I was excited to come across a can tucked way back in the corner. Corn brightens any meal and it´s one of the most loved of all vegetables (at least it is for me). What can I say, I’m a corn addict, I love its naturally sweet taste, crisp bite and flavorful center. So in my effort to whip up something more interesting than steamed corn, I pulled a few ingredients together, tossed them in a pan, and 10 minutes later I had a gourmet side dish. 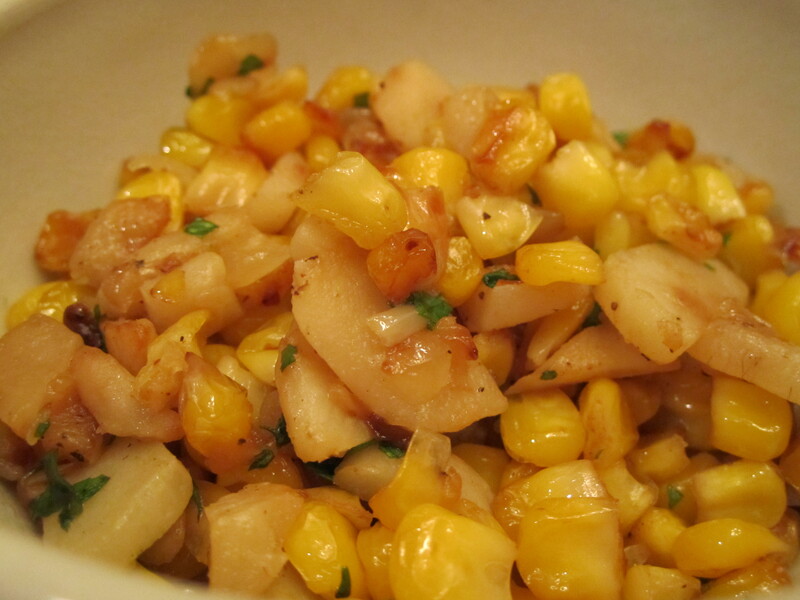 I love that sweet corn turns a bit nutty when it’s sautéed, and the sweet flavor and crunchy texture of water chestnuts gives this dish a unique quality. As the weather gets cooler, I’m always searching for warm side dishes over a summery salad, and this was an unexpected discovery. 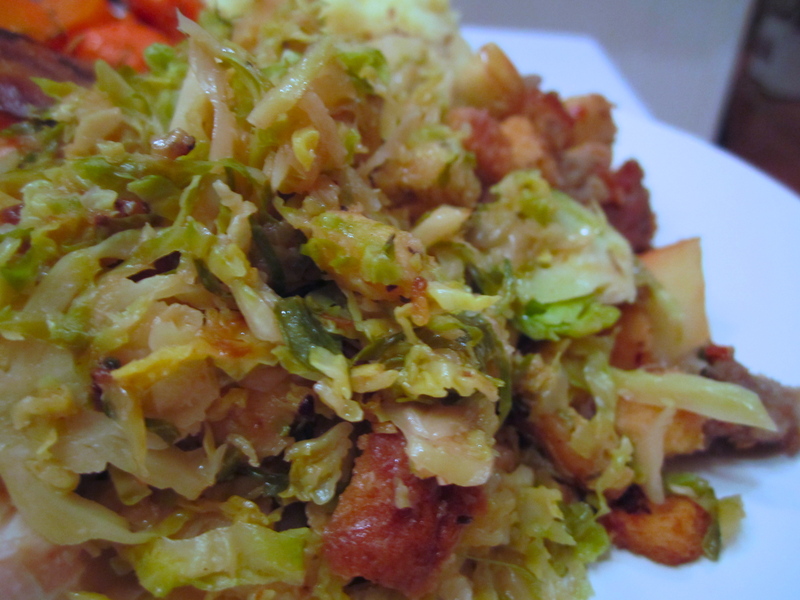 It would also make for a great topping for acorn or spaghetti squash, or a side to a juicy steak or meatloaf. This can be served warm or at room temperature. It would be a great dish to bring to a BBQ or house party since it doesn’t take long to make and packs a lot of flavor, and it’s healthy so you can feel good about getting a second (or third) helping.